Two years into the presidency of Donald Trump, many of us are still scratching our heads. How did such a corrupt, narcissistic, TV celebrity win a national election? We saw the “Blue Wall” of Pennsylvania, Michigan and Wisconsin turn red in November 2016, but why? In the past six months, publishers have launched an avalanche of books from journalists, academics and political pundits all seeking to explain the rise of Trump. Two of the most well researched and insightful books on the reasons behind the 2016 election are The Fall of Wisconsin and TheGreat Alignment. Although different in scope, one focuses on a single state, the other on nationwide trends, they offer contrasting — but not contradictory — explanations. 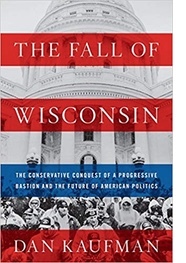 The Fall of Wisconsin, The Conservative Conquest of Progressive Bastion and the Future of American Politics, written by journalist Dan Kaufman, examines a decade of political change in a midwestern industrial state. It offers a traditional historical narrative, beginning in the early twentieth century when Wisconsin was a major industrial state with powerful labor unions and a progressive government. In those years, “Fighting Bob” La Follette and his supporters enacted laws pioneering workers’ compensation insurance, banned corporate political donations, regulated the powerful railroads, and even proposed a form of state health insurance. In the 1970s and 1980s, Wisconsin’s economy sagged. Large employers including General Motors closed dozens of plants. In 2010, a conservative, anti-abortion Republican, Scott Walker was elected governor. Backed up by a Republican legislature, within a few years he had eliminated collective bargaining for state employees, cut $830 million from K-12 schools’ funding and made Wisconsin a right-to-work state. Kaufman quotes a Bradley campaign leader who said their tactics were more effective at the state level, citing the issues of school choice and welfare reform. Having interviewed dozens of Wisconsin legislators, union leaders and conservative activists, Kaufman includes many personal stories in his narrative, making it compelling, often painful, reading. He discusses the impact of factory closures on small towns like Racine, Oshkosh and South Wayne. The author sees Wisconsin as a warning sign to the rest of the country. This is a textbook example of how wealthy, conservative groups, with a clear anti-union, pro-charter school, anti-abortion agenda can make a big impact in a formerly progressive state. 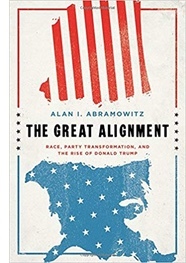 In contrast, in The Great Alignment: Race, Party Transformation and the Rise of Donald Trump author Alan I. Abramowitz sees the 2016 Trump victory as a national phenomenon, a political re-alignment fifty years in the making. Abramowitz, a political science professor at Emory University, analyzes fifty years of demographic and political change in the United States. He draws on a large number of public opinion polls and voting data sets to document a major shift in political party identification. In his view, political party identification has become “increasingly aligned with other social and political factors” such as age, gender, race and income. Large-scale immigration from Latin America, the changing role of women, gay rights, changing religious beliefs have created major social divides. On one side are those Americans who benefited from the changes, such as blacks, Latinos, the LGBT community and workers in “the new economy.” On the other side are social conservatives, blue collar whites and rural voters. This has resulted in a “revolt of the white working class.” The author notes the trend began in 1964, when President Johnson embraced the Civil Rights movement, causing the South to abandon the Democratic Party. As a result, the percentage of white voters who identify as Republican has grown from under 42 percent under President Nixon in 1968 to 54 percent in 2016. Similarly, white vote support for the Democratic Party has dropped from 49 percent to less than 40 percent in the past election. In addition, nonwhite voters comprised just 15 percent of the Democratic vote for President Jimmy Carter in 1976, but 45 percent of the party’s voters for President Obama in 2012. Abramowitz, author of three previous books, including The Disappearing Center, argues that these trends are primarily cultural and demographic. He makes no mention of the Koch Brothers PAC or other conservative pressure groups and does not discuss their role in pushing a political agenda. He uses the term “negative partisanship” to describes the sharply rising number of Americans who vote “against the opposing party rather than for their own.” This phenomenon, combined with new social and political divisions and re-enforced by partisan news sources, has produced a high-level of “straight-ticket” voting. This is one reason the Republican Party was able to capture the Presidency and expand control of Congress in 2016. According to Abramowitz, in 2012, the 90 percent rate of straight-ticket voting (e.g. choosing Republicans for President and for Congress and Senate) set a new record. The result is that “polarization and partisanship will remain major obstacles to any politician seeking support across party lines…Candidates must win their party’s nomination by running a gauntlet of primaries and caucuses dominated by voters who are more ideologically extreme” than those in general elections. Neither author offers any immediate hope for progressives and liberal Democrats reassuming power. Kaufman notes that “entrenched conservative control” of Wisconsin’s state government has already damaged the state’s public schools and university system. Kaufman states “the cost of the conservative war on Wisconsin’s political legacy has been mostly borne by the state’s citizens.” He cites an increase in child poverty rates, almost no wage growth and major funding cuts to K-12 education and the state’s university system. He predicts that the rising hostility will exacerbate existing social and cultural divisions and create major obstacles to passing bipartisan legislation.